Now this is a strange one! 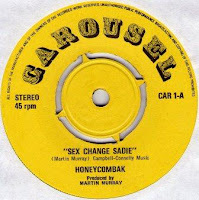 Most likely a product of the very early 70s, this single is the creation of the Honeycombs erstwhile leader Martin Murray, who left the band at the height of their success in 1964. The give-away is in the artist’s name, but the Honeycomb pre-Glam thump is in high evidence if ever the clue was missed. The lyrics? Oh boy -they make The Sad’s It Ain’t Easy (Phoenix) sounds positively subtle...It would be nice to think that the song was a direct reaction to The Kinks’ Lola, but the focus is on wink wink nudge nudge outsider observations ...Woodford Green a haunt for gender bending activities??? Who knows...Anyhow this is great fun! Goes into that Gender-Bender file alongside the Hollies' "Hey Willie" etc. Martin Murrary was not immediately available for comment. Oh, I now know that this song was inspired by someone at the Mildmay Tavern back in the pre-Honeycombs days. Martin changed the name but there was a cross dresser who worked in the pub collecting glasses. Martin himself was and is conventionally straight, but he was surrounded by people who weren't not least of which were Joe Meek, Ken Howard and Alan Blaikley.